In residential and commercial painting work, it’s not enough to conclude some colors are hot and others are not. Now, more than ever, designers and painting professionals need to have an eye on trends and an ear for customer input to realize what color choices really work best for a project. 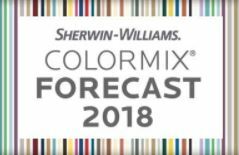 A resource worth noting is the 2018 Sherwin-Williams Colormix Color Forecast, which provides inspiration for homeowners and commercial tenants looking to customize their space through color. The Colormix forecast established three societal trends that form palettes that are driving color choices today in a variety of settings. The Sherwin-Williams team named them: Sincerity, Affinity and Connectivity. The Sincerity palette might be used with a customer who usually leans toward minimalism and simplicity in designing a space, since it infuses sand, complex grays and hazy botanicals. Customers who gravitate toward an Affinity palette may value making connections with places and cultures, and therefore want pops of color … from peacock shades to animated fuchsia or browns. This palette reflects the sharing economy and embracing cultural interplay. Health care and hospitality trends were also highlighted. Emily Kantz, interior designer at Sherwin-Williams, says using a white main color with pops of green, blue or orange is a current health care trend. The residential market inspires health care color trends, too, she adds. “When you are a patient, you want the room you are in to feel as homey as possible. You want to feel comfortable in your surroundings, even if you are in a hospital,” she said. In hospitality, Kantz sees a trend toward “deep, moody colors, and jewel tones that are very eye-catching, especially when viewed in an online search.” Colors from the 2018 forecast—Oceanside, Cape Verde, Majestic Purple and Framboise—are prime examples. In hospitality, multigenerational travel is also driving color choices. Hospitality environments are looking to create a unique experience for the entire family and a wide range of travelers. So, hotels lend themselves to being a little daring with color. You might see “dark and mysterious tones [for] an intimate setting” like bars or restaurants, Kantz explained. Bright and playful colors reflect more of a world-traveler influence, which may be seen in a lobby, café or guest room; and some hotels embrace Scandinavian minimalism in areas like guest rooms or spas, with light and chalky colors to give a sense of reflection and serenity. With many great color combinations forecasted to drive interest next year, one thing is for sure; it’s an exciting time in design for painting professionals who should expect to see more projects with bold color choices.